Incident # 18-06181 – A 28,000 sq. 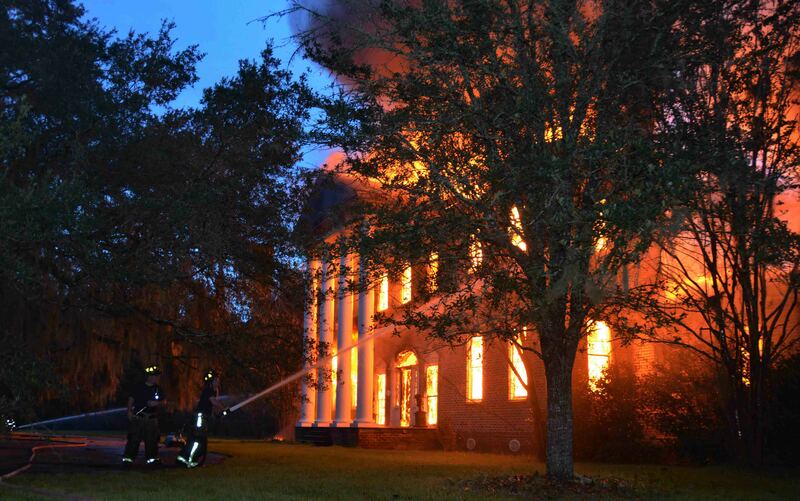 ft. home at Myrtle Grove Plantation was destroyed in an evening fire Wednesday 05-September. At 18:29, 9-1-1 dispatchers received a report from an occupant at the residence at 6938 White Hall Road advising that an A/C unit in the basement was on fire. The caller advised everyone was safely out of the building. The large home, which was constructed about ten years ago, is located at the end of a single lane, 1-1/2 mile long dirt road overlooking the Combahee River. Engine 6 and Car 107 were the first units to arrive and found that fire apparatus could not travel the road due to low hanging trees. 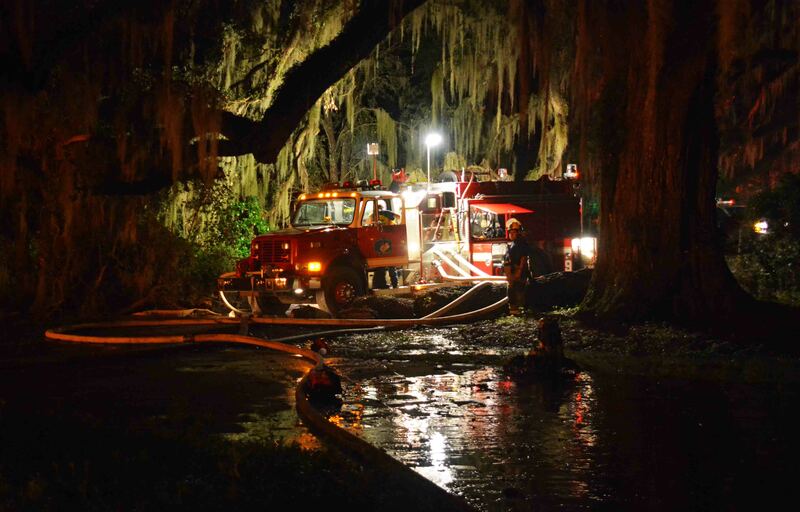 Firefighters used chain saws to cut the tree limbs as they traveled down the small road trying to reach the fire. Crews had to stop five times to cut away the low hanging tree limbs before they could reach the scene. 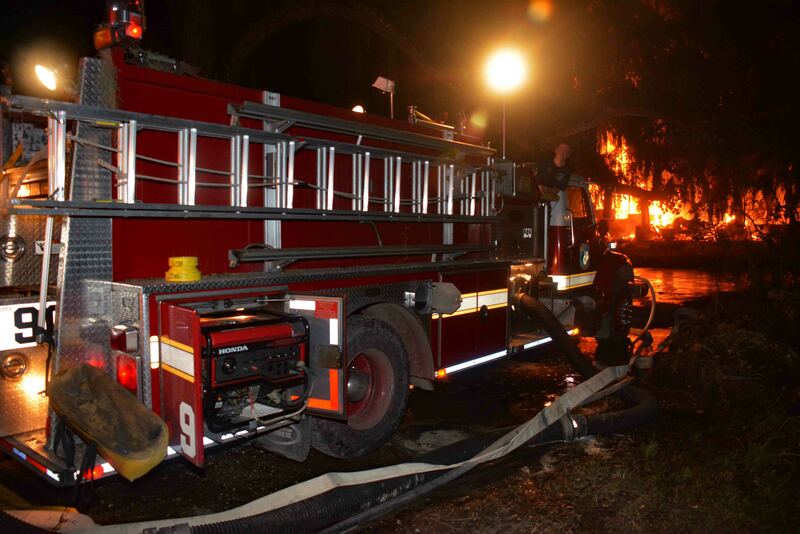 This delayed units reaching the fire and aerial apparatus could not access the scene. After arriving at the end of the road, a large Oak tree blocked access to the home. The residence is located in a non-hydranted area. Engine 2 used a large pond on the property to establish a water supply point and drafted water from the pond to refill Tenders. Once on scene, Firefighter-Paramedics found heavy black smoke coming from the interior of the building. 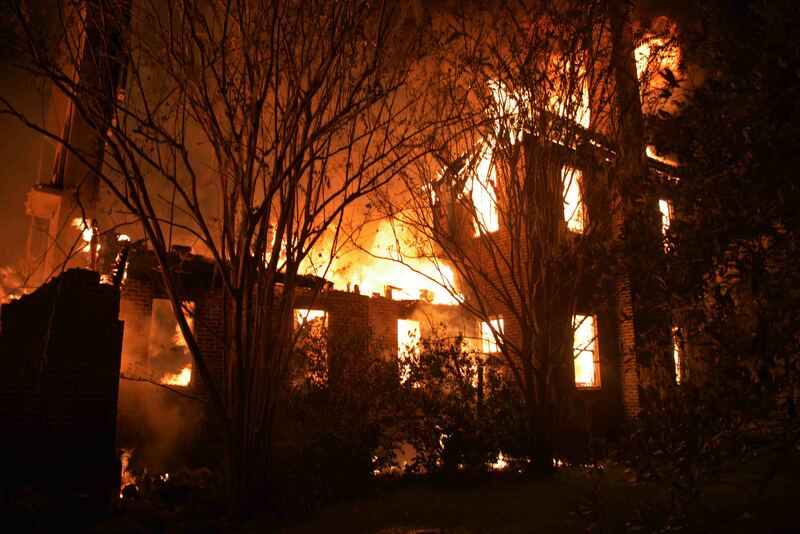 Flames were visible on the first and second floors at the rear of the structure. Firefighters deployed multiple handlines to the main building and protected exposures on one of the wings. A second alarm was issued shortly after arrival. 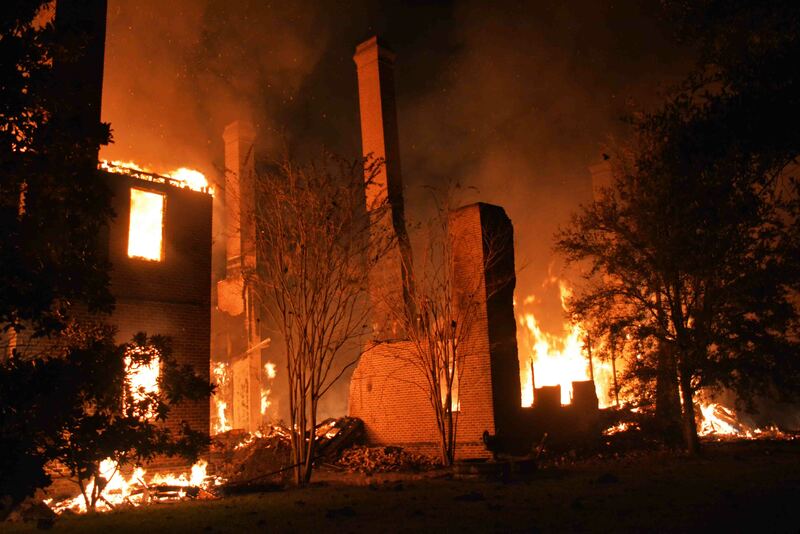 The fire quickly spread through the structure and interior conditions forced a defensive attack on the fire. The basement extended under the entire building, allowing the fire to reach all areas under the residence which was inaccessible to firefighters. Ground master stream devices were set up in the front lawn. A third alarm was requested about thirty minutes later and mutual aid for personnel was requested from nearby Sheldon Fire Dept. in Beaufort County. Additional personnel were also recalled. 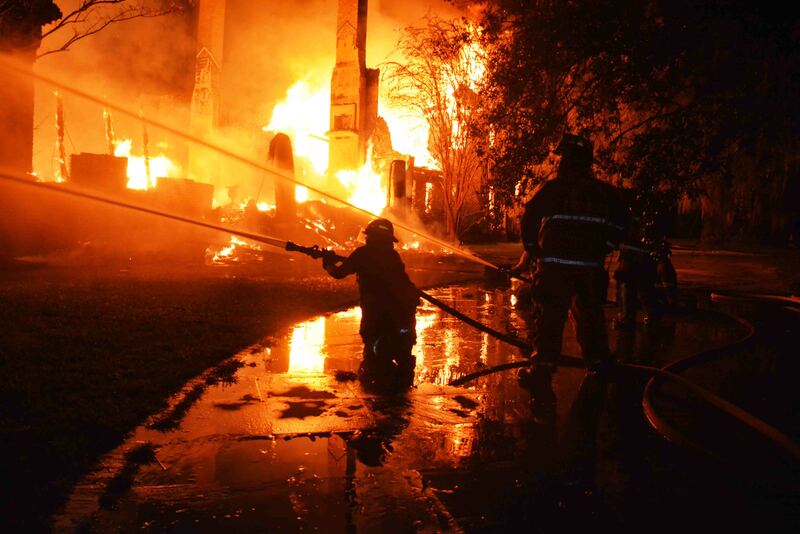 Two water shuttle operations were established with Tenders supplying Engine 6 near the residence and Engine 25 to the east of the home. As news of the fire reached the public, onlookers came to the scene, blocking the only single lane access road. Several people walked ½ a mile to view the fire leaving their vehicles on the causeway near the water supply point. This prevented all additional responding fire apparatus from reaching the scene. Incoming firefighters then had to walk the same ½ mile to begin to assist at the scene. It took over thirty minutes to locate the drivers to have the vehicles moved. Sheriff’s Deputies eventually blocked the entrance to the Plantation, allowing only Fire Units access to the property. 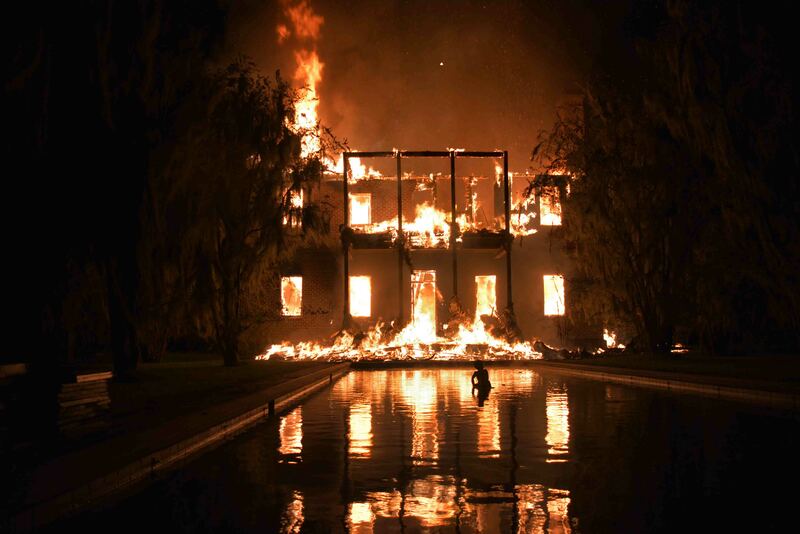 The fire eventually destroyed the entire structure. 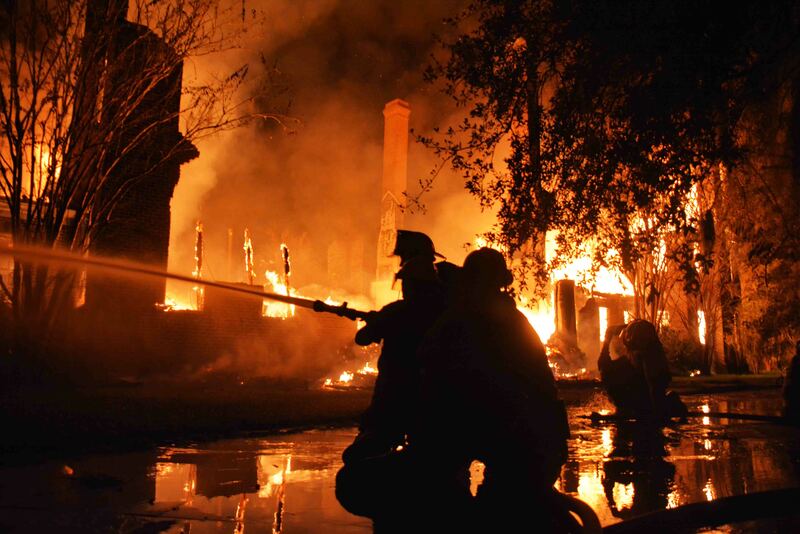 Firefighters worked through the night and early morning to extinguish the large fire. Fire crews were at the scene for 13 hours. 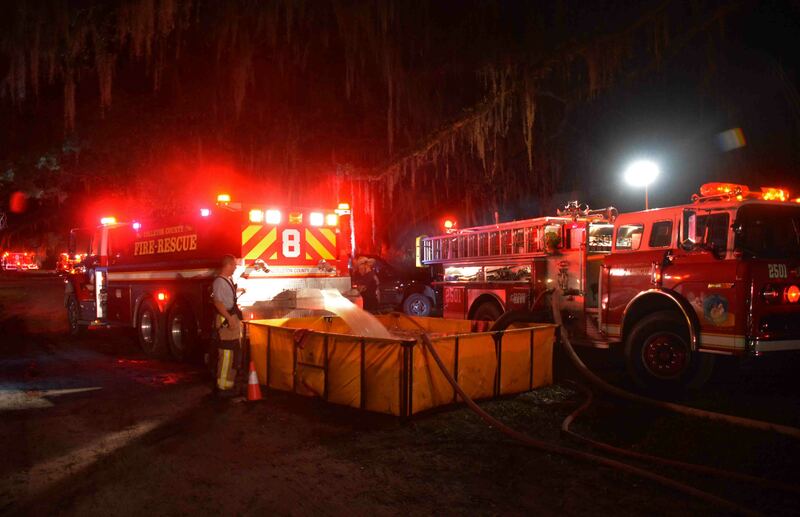 One Firefighter was injured and transported to Colleton Medical Center for treatment. He was released early Thursday morning and should be able to return to duty within a week. The fire cause is yet to be determined. Engine 1, Engine 2, Engine 6, Engine 19, Engine 25, Tender 1, Tender 2, Tender 6, Tender 8, Tender 9, Tender 12, Tender 13, Tender 19, Tender 21, Tender 25, Tender 26, Tender 27, Tender 32, Medic 1, Medic 6, Medic 9, Medic 13, Medic 19, Battalion 1, Car 107, Car 112, Car 118 and Fleet 2 responded. Asst. Chief Marty Stallings, Battalion Chief Scott O’Quinn and Firefighter-EMT Shane Weber operated the Command Post. Captain Michael Banks coordinated water supply.